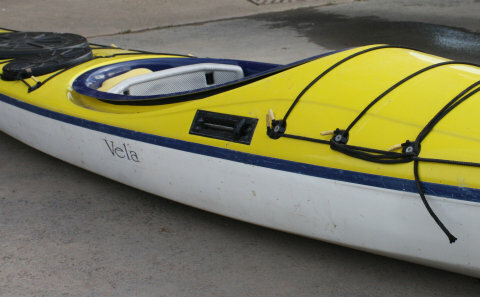 The sea kayak is quite a distinctive shape with its long sleek lines, low deck with the characteristic upsweep of the bow. To the non specialist all sea kayaks look pretty simliar but as with many topics dig a little deeper and you find that there is more to it than meets the eye. 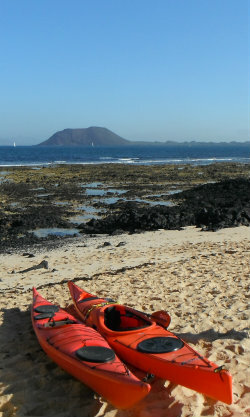 What Type of Sea Kayaking will you do? Some sea kayakers like the challenge of the long sea voyage or expedition, covering many miles whilst carrying all they need, others prefer to day trip so don't need the carrying capacity but still want to cruise. Another group will want to do some gentle rock hopping, cruise around the bays and manoeuvre in and out of narrow inlets whilst others will be out looking for tidal races and surf to play in under more extreme conditions. Different boats meet each of these needs although there is also a good deal of overlap. Perhaps the biggest choice you will make will be between the polyethylene (plastic) sea kayak and the more traditional fibreglass, kevlar, composite craft. The plastic boat will never have the same "responsive feel" that you get with a stiffer, lighter boat but if you want to do a lot of rock hopping and not worry about the knocks there is a lot to be said for a boat that is hard to destroy! If you are thinking of going the plastic route then look into the method of construction. Their are two main construction methods roto-moulding and thermoforming. The thermoformed boat will probably be more expensive but you get what you pay for and should be a better performing boat. We think we'll end up saying this on just about every page we write about canoes or kayaks. Light, stiff boats just feel so lovely and responsive, however not worrying about scraping a few rocks as you land has its attractions. Weigh this up all the factors along with price and find the optimum compromise for you. Starting with length, single sea boats are typically between 15' and 18'. (Most maunfacturers provide length, width, depth, volume and typical weight of their designs). The longer boats are generally aimed at the expedition paddler as their length enables them to cruise easily and they generally have plenty of storage. The shorter boats are generaly designed for rock hopping, shorter trips and paddling on tidal races being more manoeuvrable with plenty of very versatile boats in between. Tell us about your latest trip or read about ours. Hull shape is important as with all kayaks in determining the boats performance. For stability and manoeuvrability look for a fairly flat mid section with some rocker. For good tracking and high speeds look for some v shaping to the hull and plenty of waterline length which means a bit less rocker particularly at the stern. Plenty of volume in the bow helps the front to re-surface after going through a wave and also helps to punch through waves going out through surf. Chines refer to the shape of the hull where the shaped of the bottom meets the sides. A hard chine refers to the shape where the junction is a visible angle whilst soft chines suggests more of a rounded join. Traditional Greenland style kayaks have hard chines whilst British style sea kayaks have softer chines. Softer chines have a more forgiving feel whilst hard chines are very responsive and track well when edged but are a bit less forgiving. There are numerous variations on the theme and each design will have its pros and cons. Decks are designed low on sea kayaks to keep the effects of side winds to a minimum, a low back deck will also help make rolling easier. The Greenland style kayaks are quite extreme in how low their decks are whilst British style have more volume and consequently higher decks. Again you will find a range of options. North American style sea kayaks are generally more forgiving again than their British or Greenland counterparts with soft chines and plenty of volume to deal with big open ocean environments. They may however be considered to be a little less responsive and perhaps less suited to the very turbulent seas and currents experienced around the British Isles. Boat widths are mostly in the range from 52cm to 58cm with additional width generally improving stability at the expense of speed. Looking down from above you will see some slight differences in the shaping and where the width of the boat sits as well as some variation in the positioning of the cockpit along the length of the boat.You will also see some variation in cockpit size and shape. Boats with the greatest width set slightly in front of the cockpit are referred to as fish form, those with the maximum width slightly behind the cockpit are referred to as Swede form whilst central is referred to as neutral. The Swede form boats have a slimmer more streamlined entry to the water and is meant to give easy comfortable paddle entry, good speed and acceleration in longer boats and causes shorter boats to track well. Some of these boats with narrow bows may bury their way through steeper waves rather than riding up and over. Fish form kayaks in shorter boats can be good in surf and longer boats will ride over big swell more easily. Look out for lower volume versions of some designs if you are a smaller paddler, you won't need the same volume to pop up out of a wave if you are not burying as deeply in the first place. If you are light too much volume can make you feel like a cork bobbing around on the surface too much and you need less volume to sit the boat in the water as it was designed. 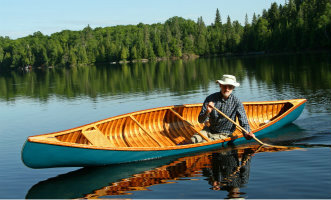 Likewise the bigger paddlers should pay attention to the overall dimensions looking for a craft with a higher volume. As we have said you will find different cockpit shapes. The smaller cockpits called ocaen cockpits require the paddler to slide their legs in and fit very close around the body. This leaves much less sprayskirt required. As a result they are great in big seas where a lot of waves are pounding the deck. Some people find the snug fit disconcerting in the event of the need to exit the boat on capsize and those who are less nimble find them difficult to get in and out of when setting off and landing. The cockpits then increase in size with the more sprayskirt required the more the potential effect of waves but the easier the access is. When looking at cockpit size consider how good your fit is when sitting in the boat with or without thigh braces. The snugger the fit the better connected you are to your boat and the more control you will have. Conversely for easy cruising and lots of beach stops a more open cockpit will be easier to get in and out of. Apart from shape and size sea kayaks are set apart by the additional features that make them suitable for use in remote locations and unpredictable conditions. If you are buying from new you will have choices to make in terms of fittings, if you are buying second hand make sure you get at least the essential fittings for your purposes and if you are renting make sure you know what you are getting before you set out and find the footrest won't adjust or the hatches leak. 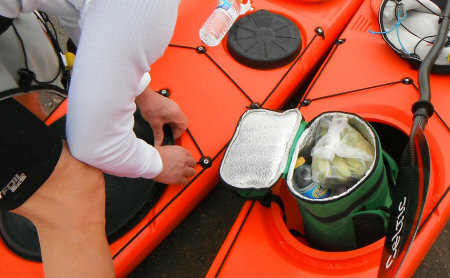 Virtually all sea kayaks will have at least one hatch, expect three and look for four with the fourth hatch located within easy reach of the cockpit for handy retrieval of smaller items such as cameras, sun glasses etc. There are a few different designs of footrest. You have the bulkhead option set out below or more likely you will have some sort of rail fitting with pedals that move up and down the rail and twist in some way to fix them in position. Try them out and make sure you can get the adjustment you want. 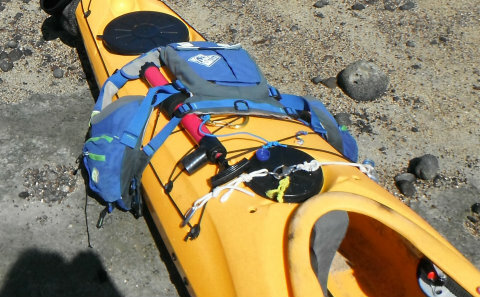 Some sea kayaks come with retractable skegs that can be dropped to give better directional tracking for distance paddling downwind and retracted when paddling into the wind and waves or manoeuvring. An alternative is to have a rudder fitted. Your rudder will sit on the deck attached to a fitting on the stern and drop down at the pull of a line and engage with the lines that attach to a pedal steering system in your cockpit. Look at where bulk heads are located in your boat. 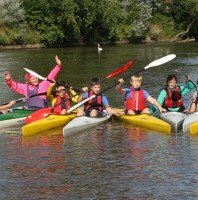 If you are having one made you may well be able to have thebulk heads either moved closer to you (shorter paddlers) or further away (those with long legs). This will affect the amount of storage you have in your hatches. For maximum strorage you can have your bulkhead made to match your leg length and act as a footrest. Clearly this won't work if you plan on sharing your boat with anyone other than your twin! 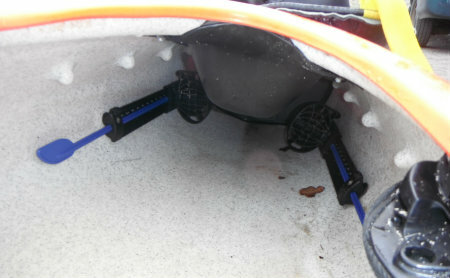 Most sea kayaks have various points on the deck (often with recessed mouldings) with fittings that can be used to attach elastic netting to retain loose items and other gadgets. Make sure your spare split paddles fit somewhere without interfering with your paddling and be sure you can locate your compass and or other gizmo's within easy view and reach. Some boats will have a compass built into the deck. If you want pumps fitted to your boat you have the choice of a foot pump which you use to clear the boat as you paddle along or a hand pump located on the deck. Any V or slight skeg built into the design of the hull of the boat will take a lot of wear as you pull up onto beaches or (hopefully not) scrape the odd rock. Most manufacturers will build a line of keel protection into the hull of the boat in the form of a strip of reinforcing along the line of likely wear. 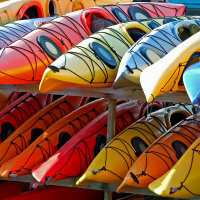 If you want to race your sea kayak in the USA Nationals you need to make sure it meets the United States Canoe Association rules which stipulate a maximum length of 18' with a minimum width of 8.5% of length and 40 pound minimum weight. You'd be best to check out the fine print here. 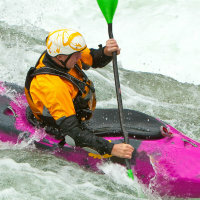 Be aware that Ocean Kayak Racing is different and uses Surf Skis.